Clear vision plays a key role in enjoyment of life. It connects us with our surroundings. It helps us understand complex concepts, and is vital to maintaining mental sharpness. Deterioration of vision reduces productivity and eventually jeopardizes independent living. 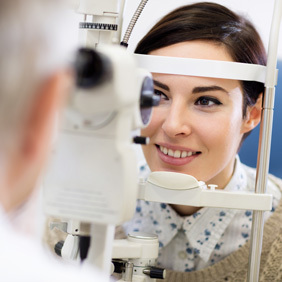 Annual vision checks from Coastal Skin and Eye Institute in San Diego help to preserve eyesight, with early detection of problems and effective vision correction solutions. Visual acuity – How clearly each eye sees. Glaucoma – Damage to the optic nerve from elevated pressure. Macular degeneration – The leading cause of vision loss, impacting more than ten million Americans. Cataracts – Progressive clouding of the lens. Dry eye disease – Untreated, a condition that leads to discomfort, ulcers, or corneal scars. What sets Coastal Skin and Eye Institute apart from vision kiosks at the mall? Our vision care center is staffed by Board-certified optometrists (OD) and ophthalmologists (MDs), each with more than ten years of experience. Licensed opticians dispense eyeglasses and contact lenses. Dr. Michelle Crosby, M.D., Ph.D., is certified in VISX and Victus laser techniques. She provides a full evaluation for patients interested in laser vision correction. Vision and skin problems are frequently related, especially in the case of chronic dry eye, eyelid disease, and surface cancers. Dermatologists and Ophthalmologists use many similar therapies. The team of highly trained professionals at Coastal Skin & Eye Institute has found that working together produces the best results for the whole patient. Our combined experience brings insight and convenience to the treatment plan. Call Coastal Skin and Eye Institute in San Diego at (858) 943-2540 for comprehensive vision checks, with a full range of skin care services right next door.